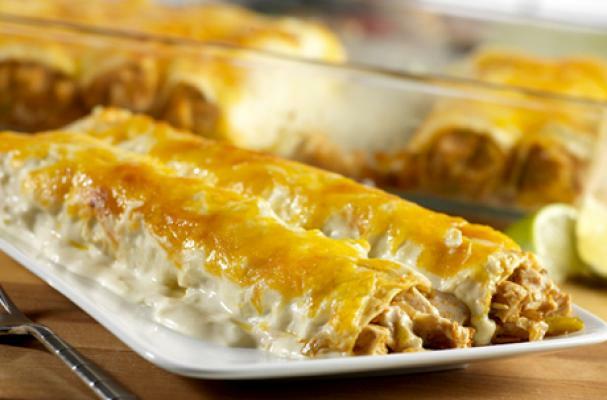 If you are tired of eating turkey sandwiches, use the last bit of leftover turkey to make these quick and easy enchiladas. Chopped turkey is tossed in a creamy sauce made from a combination of sour cream and cream of celery soup (you could also use cream of mushroom soup if you have an extra can in the cupboard). The sauce is flavored with onion, chili powder and green chilies. This innovative meal will make you fall in love with turkey all over again. Step 1: Stir the soup and sour cream in a small bowl. Step 2: Heat the butter in a 3-quart saucepan. Add the onion and chili powder and cook until the onion is tender, stirring occasionally. Stir in the turkey, chiles and 2 tablespoons soup mixture. Step 3: Spread 1/2 cup soup mixture in a 2-quart shallow baking dish. Spoon about 1/4 cup turkey mixture down the center of each tortilla. Roll up the tortillas and place, seam-side down, into the baking dish. Pour the remaining soup mixture over the filled enchiladas. Sprinkle with the cheese. Step 4: Bake at 350°F. for 25 minutes or until the enchiladas are hot and bubbling.